Chris Ings of Neumann-Goretti hopes his best recruiting days are ahead of him. Over his 20 years at Neumann-Goretti — formerly St. John Neumann — Carl Arrigale has seen many a young hooper make a considerable jump during his junior season. And typically, as that happens, the college recruitment rises as well. In recent memory, it's the likes of Quade Green, Zane Martin, Ja'Quan Newton, Troy Harper and more who became prominent Saints guards and coveted college targets both leading into and during the course of their junior years, though all had been players to watch since their earlier high school days. This year, that junior is Christian Ings. 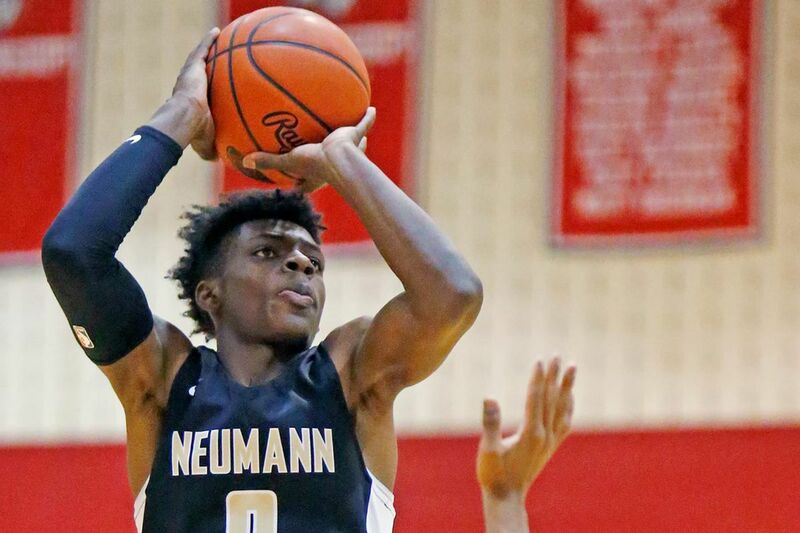 And though the 6-foot-2 guard is a major reason Neumann-Goretti is once again sitting on top of the Catholic League, only a few college coaches have been in pursuit so far. "I don't know what they're waiting for," Arrigale said. "He's been pretty damn good." After what both player and coach described as a slow start to the season, Ings is averaging 14.7 points in league play. But the bouncy slashing guard can fill the stat sheet: in a 55-47 win over La Salle on Jan. 22, he complemented 10 points with five assists, three rebounds, and two steals. He also displayed his best trait: his ability as a lockdown on-ball defender, a trait he's honed against the other talented guards who populate the Catholic League. That strength might actually work against him somewhat, in a social-media age that loves to post clips of big-time dunks and high scoring totals but doesn't always celebrate the standout defender. Ish Horn of Plymouth Whitemarsh dribbles down court while defended by Chris Ings of Neumann-Goretti. "[People] only like to post the points, rebounds, and assists; unless you have an amazing amount of steals they don't post your defensive presence," Ings said. "When coaches come to the games, they see I can guard at any level — I can guard short guards, big guards, forwards, I can guard whoever I put my mind to guard." There are certainly still some flaws in Ings' game — he's not as good a shooter as Green, who now is at the University of Kentucky, and he doesn't have quite the size or three-level scoring ability of Newton, now at the University of Miami. But it's somewhat surprising that his only three offers come from one local school (La Salle) and two lower-mid-major programs, Mount St. Mary's and Stony Brook. "It's not frustrating," Ings said. "It's just a patient chase — patiently waiting, working on my game … focused on being able to guard and frustrate any type of guards, fast or slow, shifty or quick, and definitely trying to work on my outside game." St. Joseph's, Penn and Drexel also have been in contact with Ings, who said he has heard from a few high-major schools along the way as well, including Connecticut and Virginia Tech. Christian Ings dunks against Del-Val Charter. Ings said he's not sure yet what his plans are for his final go-around with AAU basketball this offseason. Last year, he played with both the NJ Playaz and Hoop Dreamz programs. First up, he has to focus on trying to end the Saints' four-year Catholic League title drought, as well as continuing a string of four straight PIAA state titles. He knows the college attention will come. "I'm just looking forward to the summertime," Ings said, "where I think my recruitment's going to explode."